An orthopteran is ay member of the order Orthoptera, an order of insects represented by more than 20,000 species found worldwide, especially in tropical regions. 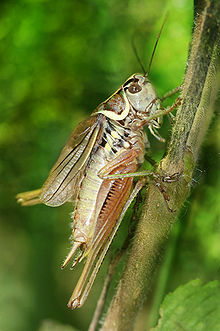 Orthopterans include katydids, crickets, grasshoppers, and locusts in the suborders Ensifera and Caelifera. The term was formerly used to group together the orders Dictyoptera (mantids and cockroaches), Phasmida (leaf and stick insects), and Grylloblattidae (grylloblattids). Most of the species feed on plants, have chewing mouthparts and undergo incomplete metamorphosis from egg to nymph and adult. Earwigs, termites, and webspinners are also considered to be Orthopteroid insects. Length: up to 10 centimeters (4inches).